Ashlar-Vellum leads the way with uniquely intuitive and easy-to-use CAD and 3D modeling software for both Macintosh and Windows. All Ashlar-Vellum products feature Organic Workflow, the non-linear creative process that maximizes productivity for creating outstanding products through easy design iteration and transparent tools. The primary difference between Ashlar-Vellum’s product and other solutions available on the market is not the depth of Cobalt’s features, but the availability of all the features in a holistic, transparent way that enables the user to create concepts in an intuitive, unobstructed manner. 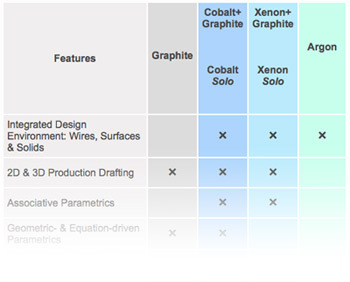 Click here for CAD and 3D modeling products comparison chart. By simplifying the technical aspects of the design process, Ashlar-Vellum software lets you focus on your design — giving you a competitive advantage and increased profitability. But don’t take our word for it, see who’s using Ashlar-Vellum software to design some of the most innovative products on the market. Download a free trial today and see first hand why Ashlar-Vellum beats any design software package for user satisfaction and productivity — period.